Depends on mounting surface and strength of wall. • Dual Fan Cut Outs. Easy to put together will take no more than 30 mins , less with power tools. Condition is Used. Server cabinet is 91cm in height. Free Standing Server Cabinet With Rack Parts. Condition is Used. Rack capacity - 47U. Make - APW. Smoked glass doors. 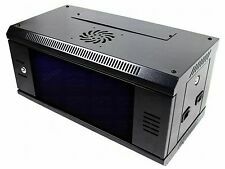 Prism Server Cabinet 19” 20U With Keys And Shelf. Condition is Used. Perfect condition - removable panels - shelf included - perfect movement on casters. Collection from Oldham - Monday to Friday 9-5 I think it’s a 20U - it has 60 square holes from top to bottom. Size - 600mm wide x 1000mm tall x 600mm deep. Rack mounted switches as well as power distribution units. rack to back. Perfect for mounting. Supplied with a Bag of Nuts & Screws. W x D x H mm : 550x450x320. Lockable Glass Door. Approx 36cm of usable space from. Dell 42U 4210 Server Rack Enclosure Cabinet All Doors, 1 Panel. Condition is Used. Collection in person only. The cabinet is displayed without doors or single panel as they are stored securely. Having moved house, this is now too large for my needs - so unfortunately the main chassis is sat outside. Standard 600 wide and 450mm deep. 18U [1 mt H]. 10" wall cabinet. Wall mounted cabinet. In the last few years prices of server racks have been high, but Rack Supplier has succeeded in reducing their prices while maintaining very high quality. 600mm dept, 500 mm Hight, 570mm Width Data Wall Rack audio cabinet. Condition is Used. All cables and network port patch inc. What you see you get. 550MM Deep Wall Mounted Cabinet •Also available in 450MM. •Quick Release doors and Side panels. •Adjustable front and Rear 19" mounting profiles. •Removable cable entry panel in top and base. Each cabinet is designed with strength, ease of use and aesthetics in mind. Dell 42U 4210 Server Rack Enclosure Cabinet All Doors and Panels - FINAL LOT!!! Help maximise the overall performance of your Dell rack-mount servers with this 42U enclosure built to industry standards. 42U Rack Specifications. Dell PowerEdge Rack 4210. The PowerEdge Rack 4210 features passive cooling capabilities with ventilated front and rear doors which help to optimise airflow throughout the enclosure. 5 out of 5 stars - Dell 42U 4210 Server Rack Enclosure Cabinet All Doors and Panels - FINAL LOT!!! 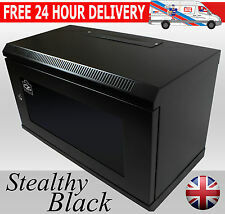 1 product rating1 product ratings - Dell 42U 4210 Server Rack Enclosure Cabinet All Doors and Panels - FINAL LOT!!! 12u Desktop / Wall Mount Rack. 12u Free Standing or Wall Mounted Rack. Rack Brace for Ad-Tek Products Wall Mounting Desktop / Wall Mount Rack. -Cable access on top and bottom of rack. Specification M6 Cage Nuts and Bolts. Screw Length 13mm. Colour Black. Get In Touch. Get Social. to us, If you have any issues with your order. This network rack/cabinet features a sturdy, compact design that can be positioned almost anywhere, without wasting valuable floor space. Servers are the largest and most vital components in your network, so it's important to take good care of them. 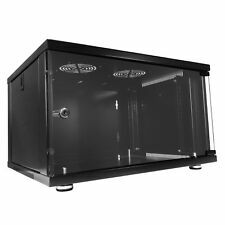 A server cabinet, or rack, stores your servers correctly, allowing proper airflow and easy access for maintenance. Browse eBay’s vast selection of new and used server racks to find the ideal server storage solution for your home or office. How is the size of a server cabinet measured? The internal height of a server cabinet is measured in units of U. One U is equivalent to 44.45mm, so, for example, if the height of a server cabinet is listed as 6U, this means that the internal height is 266.7mm (6 x 44.45mm). The external size will be larger than the U measurement as extra space is needed for fans, cables, and other accessories. The width of server cabinets is measured in mm. When shopping for a server cabinet, it is important to be clear on both the internal and external measurements to ensure that your new cabinet will fully accommodate your equipment and also that the rack will fit into its designated space. What are the benefits of using a server cabinet? Server cabinets and racks are designed to keep all of your servers neatly stored and protected in one place. A server rack will protect servers from bumps and spills and also provide correct cooling and ventilation to prevent overheating. Servers stored in racks are also easy to access if maintenance is required, and choosing a lockable server rack will help to increase your network security. What features do server cabinets have? Ventilation: As servers generate heat, good ventilation, including vents and grills to allow air to flow through, is essential to prevent overheating. 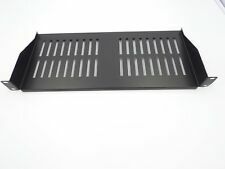 Fans: Roof-mounted fans expel hot air from the cabinet to keep it cool and rack-mounted fan units move air around the cabinet in whichever direction is required. Security: Lockable doors can be used to prevent unauthorised access. Cable management: Items such as cable tidy bars, cable trays, and brush strip panels keep cables stored neatly out of the way. Shelves: To hold extra equipment, shelves are available in a range of options including ventilated, fixed and telescopic shelving. 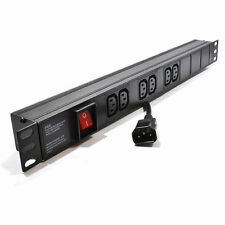 Power distribution units: Available in both standard and intelligent models.